Visually impaired people suffer a lot in their daily life due to various challenges come across on the way. To help and lower their suffering, Anang Tadar, a 9th class student of New Galaxy Academy student has invented a special goggle that works on the principle of ‘echolocation’ used by bats, to navigate and find food in the dark. The device called ‘Goggle For Blind’ (G4B) detects objects in their surrounding without any physical contact. It works on echolocation principle which uses sound waves and echoes to determine where objects are in space. 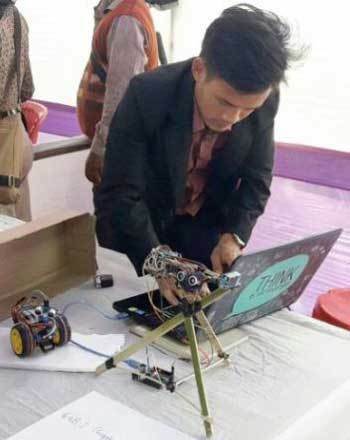 He is coming from a poor family and was very difficult to develop the gadget. With a vision to help people by creating the people-friendly product, he has used all his pocket money and sometimes borrowing money from his friends. The invention G4B has won the Dinanath Pandey Smart Idea Innovation Award at recently concluded Regional Level Science Festival at Regional Science Center at Guwahati. Interestingly, the National Ignition Facility (NIF) and the United Nations International Children’s Emergency Fund (UNICEF) are impressed by the invention and willing to launch in the market. He had also participated in National Level Science Exhibition at Rastrapati Bhawan, New Delhi on 6th March this year. Anang plans to create few G4B prototypes to test on the blind people and needs financial assistance as each gadget costs around Rs. 15000.